Genie comes in a single back size, but don’t let it fool you. Via worked hard on this chair to offer the best in upper back and shoulder blade mobility; users have better, freer upper body movement and flexibility – creating a more comfortable task chair. Genie’s back is made of elastic polymer that stretches and breathes. The back leans smoothly, offering easy movement. All this means that your back is supported the entire work day. Customize Genie with its three options in seat type, including a petite option, to make the perfect base for you. All three types of seats can be made with either breathable fabric/mesh or vinyl – which is perfect for use by heath care professionals for its antimicrobial properties. Genie also has frame finishes in black and white, and multiple options for the base. Choose from eight mesh colors for the seat, always with matching seat colors. 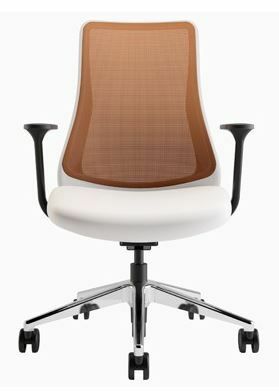 Genie can also be used as a task chair or as a conference chair – it’s an office favorite. We love Genie because of how unique the shape of the chair is. The mesh seat is another of our favorite characteristics: it keeps you cool and comfortable during those long work days. Let’s find you your perfect Genie match for your next office update!